In the 1960s, payola was rife especially in America. This is where promotion people used to pay radio DJs and producers to programme their song so they could gain royalties. It happened in the UK too, but perhaps not quite so blatantly. Producers and DJs at the BBC particularly were taken out for very long lunches and wined and dined to win them round to achieve the same desired effect. Some scrupulous record companies ’employed’ people to go round buying up multiple copies of whatever they were promoting in order to get a higher chart position, thus kick starting radio and TV airplay which in turn led to genuine sales. In 1978, Neil Young released an album called Comes a Time which only reached number 42 in the UK but went top 10 in the States. 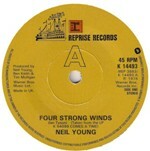 In an interview with Rolling Stone magazine years later, Neil revealed that he bought 200,000 copies of the album himself, yet no one seemed to bat an eyelid at the time. Neil explained, “Oh that was because it was a mastering error. The tape got damaged when it went through the airport or something. I had to go back and use a copy of the master – which itself was a copy, but it had better-sounding playback than the other one.” The song that closed that album was a song called Four Strong Winds. Almost everything Young records were written by him, but this track wasn’t, it was written by a fellow Canadian called Ian Tyson. Ian was a country singer who also recorded as one half of the duo Ian & Sylvia. He wrote and recorded the song in 1963 and it did well in Canada, but nowhere else. A version by the Brothers Four later the same year was a minor hit, the following year Bobby Bare gave it a different country arrangement. A cover version by The Vanguards did well in Europe when they cut it as Mot Ukjent Sted and was a big hit in Norway in 1966. The Hep Stars cut it with that same title and scored hugely in Sweden in 1967. Ian and Sylvia met in Toronto and began performing as a duo in 1959. By 1962 they had moved to New York City and were at the centre of the Greenwich Village Folk Scene. The pair married in 1964. So what was Four Strong Winds all about? Well it was written about a lady Ian had met in the mid fifties, her name was Evinia Pulos. The two had met in Art College in Vancouver when she was 18 and he was 22. Their chemistry was instantaneous, but complications ensued and in 1957, they parted company. Evinia describes what happened, Ian was a very good looking fella and soon after we’d met we had plans to go to Toronto to be artists together and I thought we’d be spending the rest of our lives together,” she said with a deep feeling of regret. The strains of the song are there in this letter. Ambivalence. Regret. Above all, longing. ‘I’m not coming back,’ Ian Tyson wrote to Evinia in September 1960, two years before he penned the folk classic. The lyric, ‘But our good times are all gone, and I’m bound for moving on, I’ll look for you if I’m ever back this way.’ still haunt her because after all, she was the dark-eyed beauty Tyson had in mind when he hunched over a guitar in his manager’s New York apartment and put his thoughts to music.